Let me clear the air here first. Iâ€™ve been a long term reader and fan of AppleInsider, but their unjust hatred for Microsoft has started to get on my nerves. I mean just what were they trying to prove here? Bing and Safari arenâ€™t even in the same product line â€“ comparing their market share is just plain idiotic in my opinion. Now I know they werenâ€™t the actual ones who made the comparison, but still they had their senses. If Apple boys are taking so much interest in Microsoftâ€™s search engine ventures, then why donâ€™t they beg Apple to get into the business too. That would make it easier to draw the line between Microsoft and Apple â€“ instead of them having to rely on Google. You can also read their views about what Apple said about the Laptop Hunter Ads. They are still trying to defend Apple even though the company themselves have clearly admitted their defeat. Oh and just a couple of lines from my side, Iâ€™m not a fan of Internet Explorer. In fact my blog doesnâ€™t even support IE. I always favored Firefox ever since I got my hands on it. P.S. If you really have to compare search engines and browsers, then it really makes sense to compare Bing vs. Google Search and Chrome vs. Internet Explorer. 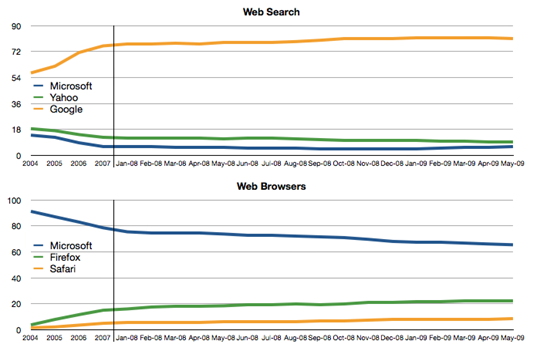 Bing is relatively younger than Chrome by the order of at least 9 months. Still you can see the difference in their market share. Ran 45 queries in 0.409 seconds.